I have been looking at a copy of A Glossary of Cornish Sea-Words, by R.Morton Nance, published by the Federation of Old Cornwall Societies in 1963. It fell open . . . The interruption to my passage plan has meant that I have to get from Brixham to Plymouth, a distance of a little over 40 nautical miles by this evening. 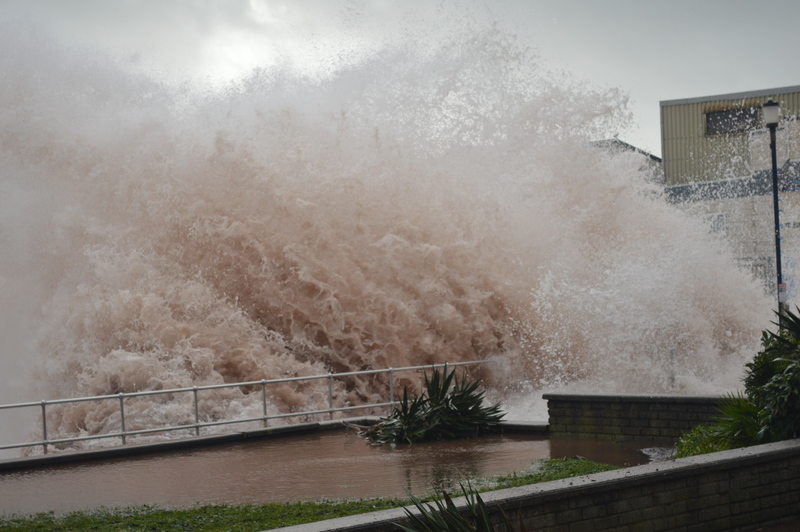 This is no problem on paper – but there will probably be no time for fishing. Also the tide will be wrong going round Start Point. I had planned to round the Point, which is about 13 nm along the coast from here, yesterday evening with the tide carrying me, I will now reach it around the middle of today with the tide against me. 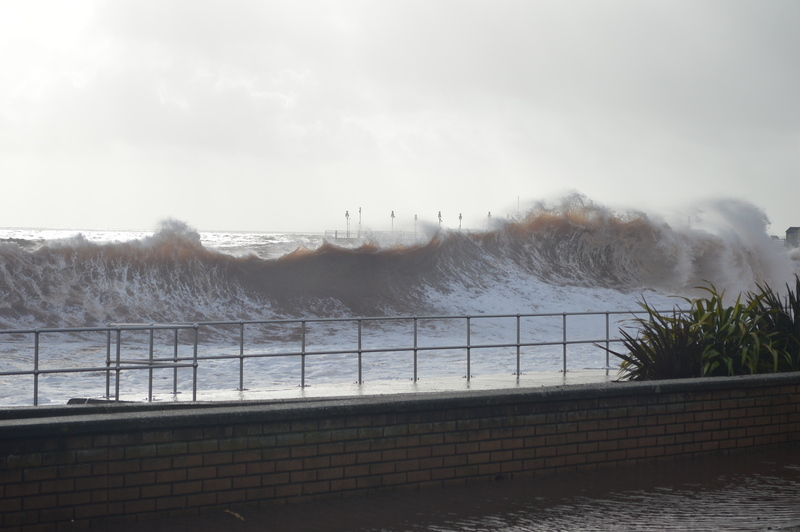 The wind has gone round to the north east – almost the opposite of yesterday morning. 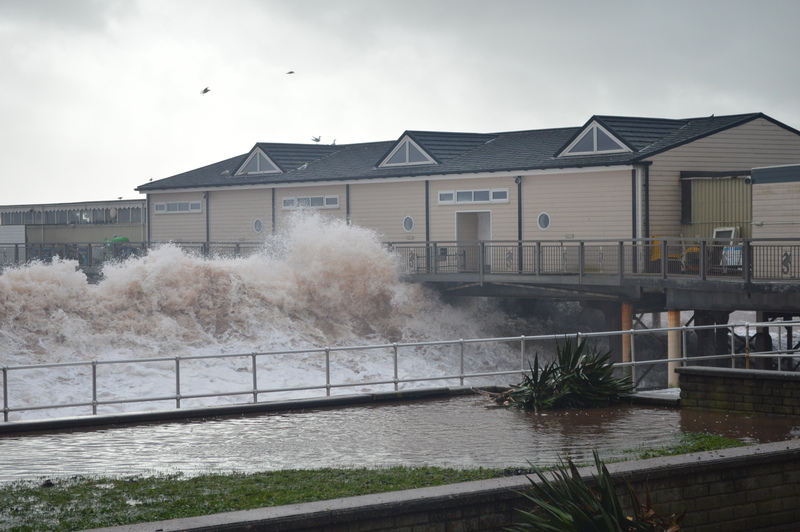 I took the following images in Teignmouth earlier this month during one of three exceptional storms to hit the UK. When the waves swamp the very ground that we love – ground that has seemingly been there for ever, ground we have always taken for granted, should we shrug our shoulders and walk away? Or should we look at it afresh and see it for what it is, the erosion of a fragile and valuable asset that makes a harsher world bearable? Should we keep repairing it or should we let it go? The tide of languages is flowing and unstoppable. In many ways it is exciting. It is evolutionary. But it is eroding the core beneath it – the relationship-base that lies at the heart of humanity. Whatever language we speak, it’s our choice and we have to decide . . . now. I first read Dorothy Nolte’s poem in the 1970s. I can’t say it better than this. (For those who speak the language of gender, please note that she later changed the wording to make it gender neutral – ‘child’ to ‘children’. I have kept to the original because that’s how I first learnt it but I acknowledge the difference). If children live with suspicion, fear, grief, mean-spiritedness and vindictiveness, what are they learning? If children live with understanding, respect and trust, what are they learning? The world is full of the former. They get all the headlines. The world is also full of the latter. But you have to work harder to see it. Now we have reached a point where I must stand back. It is easy for me to sit at the keyboard and write assertions. 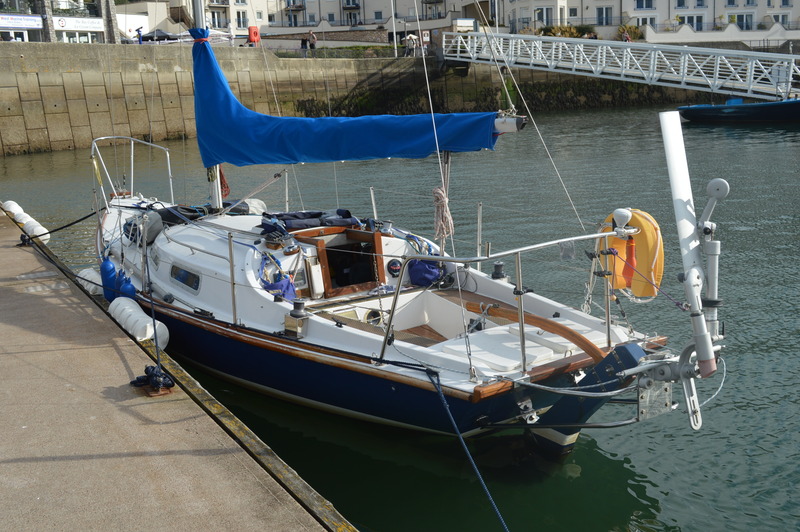 I am an ex-dentist, a white, 65 years old, married Cornishman who likes boats. There are a few people in the world who fit this description but the overwhelming majority don’t. It has been my intention in these posts to paint a picture. It is my picture but I want to encourage you to take it and do whatever you can with it. For you to do this, we need a starting point – that initial rapport I mentioned earlier, and I acknowledge that the description of me above might get in the way. However . . . There was a time before I thought about things, before I worried over the problems of daily life, before I thought things through from start to finish, before I made decisions that pushed me in one direction or another, before my knowledge, skills and attitudes such that they are affected others. These past few weeks standing astride the rather shaky line between a life that has now finished and one that has barely started seem to warrant a reflection on a moment when my own life was raw experience, untrammeled by the education of others. Was there ever such a time? – I wonder. If I can recall it, will it make a difference? – I don’t know. But let’s try and see what happens. This is a sunny day. I stand on the waters edge. There are the happy sounds of people talking, laughing, shouting. Among them are two familiar figures, my mother and father. Even though they are a little further away, it is comforting that they are there. I feel safe. There is the sound of water too. Small waves shushing round my ankles, the splashing of happy people and below this the deeper resonance of the sea breathing in response to the wider ocean beyond. I don’t know about the wider ocean but I do hear the sound it makes. I lick the back of my hand and taste sea-water. I feel the sand gritty between my toes. As the waves wash over my feet, the sand moves and I feel my feet sink gently into it. A bigger wave breaks against me and I step back and find no sand there. I tumble backwards into a deep pool, the wave rolling me over and over. I don’t know whether I am upright or upside down. I bounce on the sand at the bottom of the pool. The water feels cold. It pushes me first one way then another. My eyes are open and I see sand and then sky through the water. It is indistinct, wavering. There is sand swirling through the water. My mouth is open. I swallow. Water runs into my nose. My ears are full. My arms are waving and legs kicking. From being warm and comfortable and happy, I become instantly helpless and terrified. I cry out but make no sound beneath the surface. And then, as suddenly, I feel hands around me and I am lifted into the air. My eyes sting. I cough and splutter. I hurt inside. Water runs out of my nose, my ears. There is the taste of tears and the stronger taste of seawater. My arms around a neck. My cheek on a shoulder. My cries coming back. Soothing words. A comforting hand rubbing my back. Whoever you are, wherever you are, whatever you are, there was a moment in your life when the raw world first touched you too. It may have been a good moment or a bad moment. The above was mine. I share it with you . . . in the greater quest for understanding. Having completed the fourteen posts I had set out to write and not yet being satisfied, I am going to insert this as an extra post to see if it helps. I awoke in the middle of the night not thinking about the practice. So there has been progress of sorts. What I was thinking about was how to describe in non-digital terms the face-to-face relationship I have been highlighting when I am actually using a digital medium. If I fail to do that then my argument fails and, in my small world, digital technology will have taken over at the expense of a core relationship. In the previous two posts I have produced two linear images to demonstrate the continuum of a relationship where ‘Trust’ is at the top and ‘Vindictiveness’ at the bottom. The images consist of straight lines with the various stages marked at more or less equal intervals along the line. In computer-speak, this is a simple algorithm. Algorithms are extremely useful tools from which we can derive policies, protocols and procedures. They have become an essential part of almost every language I have previously mentioned. However, this way of looking at life has no place in the human relationship I am talking about. There is are complex patterns and rhythms in human relationships. It could be likened to the difference between painting-by-numbers and true art. In painting-by-numbers an outline drawing is created for the “artist” and a number is assigned to each separate area of the drawing. Each number represents a particular colour and the “artist” is invited to fill the areas in the drawing with that colour. He/she can follow the rules exactly or, if they are feeling a little freer, he/she can change the colours and even meld different areas if they so wish but nevertheless the work is confined to the prescribed drawing. This is how basic software works. However sophisticated software has become (and it has become very sophisticated), the actions of the “artist” are defined by the software. In producing this series, I have used Scrivener, WordPress, Freemind and ACDSee imaging software. I like them all because I can use the framework they provide to put on screen what I am trying to say. The problem is that the very thing I am talking about is even more sophisticated than the software I am using. Hence the painting-by-numbers/true art analogy. A true artist is faced with a blank canvas. Which colours and where, when and how he/she applies them is entirely a matter between brain and brush. The result is instantly available only to the artist and those immediately present. The purpose of the exercise is to produce a work of art. The quality of that work is confined to the artist and a few others. Dissemination has to wait and in most cases may never happen. So with face-to-face relationships. The quality of the relationship is between the participants and it is for them to value it or not. To take this further, I have likened a relationship to a painting. However a painting has borders. If we think of it in terms of music then the borders fade away. There is an infinite variety of choices from single notes to complex chords, from quiet to loud, from short notes to long notes and every combination between. The potential is more or less infinite. The extent of the composition is confined by the composer/s. Mendelssohn wrote that ‘music cannot be expressed in words, not because it is vague but because it is too precise for words’. Man has spent eons trying to put words to relationships – defining and redefining them. The problem is the human condition. When one physical, emotional, intellectual and spiritual being with all their physical, emotional, intellectual and spiritual strengths and weaknesses meets another physical, emotional, intellectual and spiritual being with all their physical, emotional, intellectual and spiritual strengths and weaknesses, a work of art ensues – it’s value is between the participants. Do you always need to break the resultant interaction into some defined chemical reaction or do you let it germinate and grow? There is a reason for both. The problem is that the scientific intervention to break it down in the form of digital technology has the means to take the art out of the relationship and my comment is (and please feel free to prove me wrong) that digital technology has so impinged on the language of all sections of society as to be a detriment to the face-to-face relationship that is the core relationship of humanity. 9/14 A negative language by default? So far, so easy. Now it gets more difficult. In my previous posts, I have been talking about language – the way we string words together. Now I want to point out that I am also talking about attitudes – patterns of behaviour shaped by the language we use towards each other. I am using the concept of a continuum as the outline for a particular language (and hence the pattern) that I want to highlight. So . 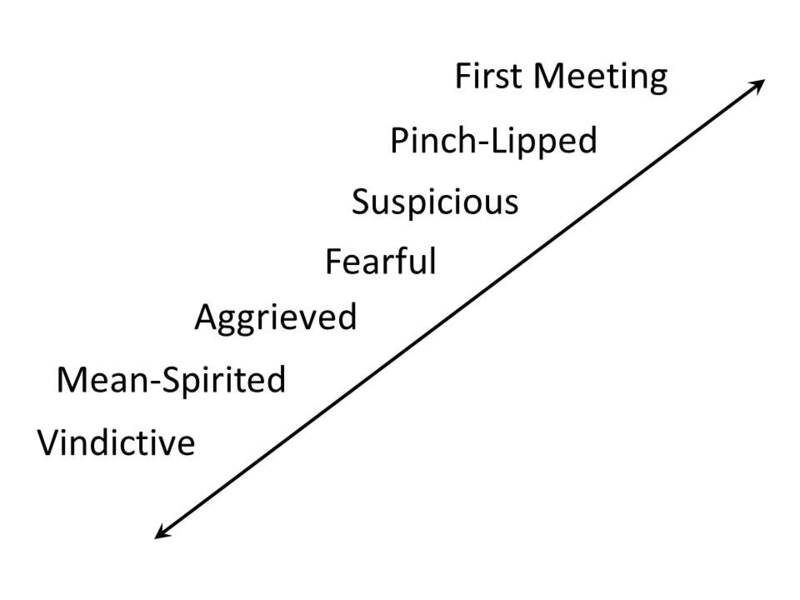 . . if the positive end of the continuum runs upwards from a central point of the neutral meeting, leading to rapport, then understanding, then respect, then trust, (see the previous post), then the negative end of the continuum could be said to descend from that same neutral meeting to being pinch-lipped, suspicious, fearful, aggrieved, mean-spirited and ultimately vindictive. It is extremely simplistic (not to say arrogant) to try and sum up human behaviour in a straight line. I apologise. I am trying to paint a picture and I have to use words to do it. If the individual words resonate with you then mark them but try and keep the whole picture in mind. I suggest that it is very easy to slide from being suspicious to being fearful and aggrieved and, if there is no resolution, then to becoming mean-spirited and ultimately vindictive. Look around you, read the newspapers, watch the news on TV. It is the vindictive end of the continuum that causes the headlines. However, I wonder if this is so because we expect the other end, the respectful end, to be the norm and the vindictive end to be an unfortunate but rather exciting aberration – containing attitudes that we can explore and exploit because we are assured that all is well really. The attitudes in the continuum are natural human ones but some are more productive than others in building the civilised, trustworthy, caring society I mentioned in an earlier post. My concern, and the only reason I am pursuing this, is that our breaking down of society into sections, each with its own language, each promoted with increasing success, has resulted in our beginning to neglect to maintain “understanding, respect and trust” across society as a whole and we are in danger of becoming a pinch-lipped, mean-spirited, vindictive society by default. In the next post, I will put this into context and give a specific example of why I think this is happening. This series has developed into a comment on language. I have made some general statements; now I want to be more specific. I have recently retired after forty plus years as a dentist. One of the privileges of being a dentist – (or doctor or any other health-related professional), is that you spend your days meeting a succession of individuals. Each one is a solid, whole, complete human being – a physical, emotional, intellectual and spiritual being with all his/her physical, emotional, intellectual and spiritual strengths and all his/her physical, emotional, intellectual and spiritual weaknesses. We face this person with all the knowledge, skills and attitudes of our profession that we can muster, knowing that science does not yet have answers to every aspect of their being nor technology the solutions. And, however experienced, I too am a human being with strengths and weaknesses of my own and, as such, not totally master of the art of caring for this person. (This might appear negative but bear with me). So there we are, together in a room, trying to sort out problems and find solutions. In the dental surgery, these problems, whether current or potential, are predominantly physical. However, all the rest – the intellectual, emotional and spiritual aspects of the person, come attached. Not only that but there is a third person in the room – a nurse, with strengths and weaknesses all of his/her own. The three of us could be described as imperfect people living imperfect lives in an imperfect world. And yet, in order to make the interaction worthwhile, we have to find a way of building a productive professional relationship. In the last post, I talked about language, the way people address each other, how languages have become digitalised and how, as a result, the language used by certain groups of people can grow to dominate the language of other groups. There is a constant evolutionary competition where at any one time the language of, say, economics, overwhelms the language of, say, politics, or vice versa. However, there is a universal language, a particularly important one for the healing professions because it works towards the aim of their particular relationships – to leave the person in better health than when they first met. It is a non-digital language well-known to the physician. Relationships ebb and flow. However well you get on with someone, you are closer at certain times than at others. Thus there is a sliding scale – a continuum, in a relationship. We tend to be more aware of this in negative situations but it is a common characteristic whether the relationship is positive or negative. Starting with the time when we did not know this person at all, our first meeting is hopefully a neutral one with no prejudgment. (This is not necessarily so. For reasons stated in the last post, we are already prejudging to a certain extent). Nowadays trust is treated as a right – a label acquired automatically. In reality it is a value that is earned, hence the word ‘trustworthy’. 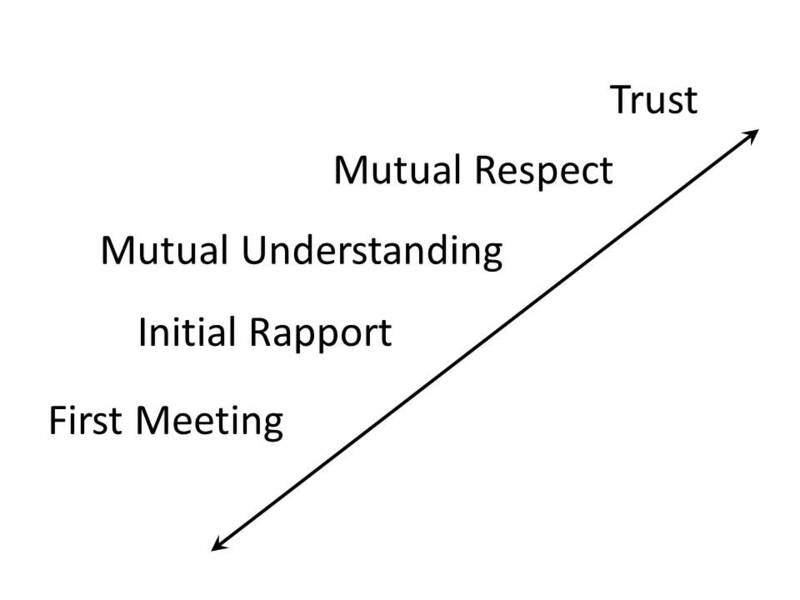 We must go through those stages of rapport, understanding and respect to get there. It is an ‘uphill’ task. Going downhill is much easier. We can lose trust but still retain mutual respect, or lose respect and still retain an understanding of the other person. The relationship is less close but still positive because trust is a result, understanding is the key. And we get to understanding by actively looking for some initial aspect of mutual sympathy or empathy – (that initial rapport) with the other person. This may emerge naturally but more often comes from an opening, an expression of a mutually recognisable idea or feeling provided by one party or the other. Of course there are specific languages in medicine and dentistry – full of specialist jargon. These should be reserved for doctors, dentists, nurses and everyone else in the health professions. However, the language above is the language of the true physician. It is a relationship-based language, reaching out to individuals, actively working to build relationships that heal.